Free drinks in NYC. Sounds pretty terriffic doesn't it? Well, we've arranged it for you! 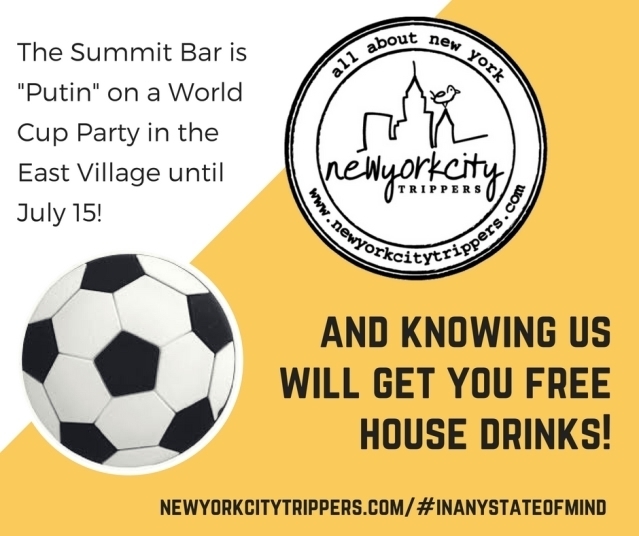 Tom - from the Summit Bar in New York's East Village - sent us an e-mail to let us know about the pop-up he's running this summer for the World Cup and he invited all Newyorkcitytrippers to come down for a cocktail at least one of the games. Mention "NYCTrippers" and Tom and his crew will give you the first round of the Summit's delicious house shots for free. Wear a football jersey and the second round is on them aswell! Summit Bar, 133 Av C, an East Village cocktail institution will play host to casual World Cup brunch enthusiasts and soccer fanatics alike for a month. From 8am every day. For every game, between June 14 and July 15. With Russia as this year’s host, we thought it appropriate that the event be held in partnership with Cook For Syria – funds raised will be donated towards UNICEF’s Children’s Fund. A collection of pictures on my Iphone of women in NYC: International Women’s Day. KLM is celebrating its 98th birthday by offering discounted airfare to New York City!